The deep depression over southeast Bay of Bengal moved westwards since last observations,6 hrs. 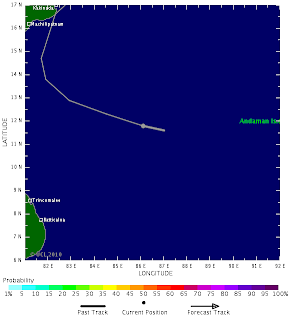 ago,intensified into a Cyclonic Storm ‘LAILA’,as per IMD status given, and lay centered at 0530 hrs IST of today,the 18 th May near Latitude 11.50N and 86.50E, about 700 km east-southeast of Chennai, 800 km southeast of Visakhapatnam. Internationally, it is still in the "Tropical Storm" category. 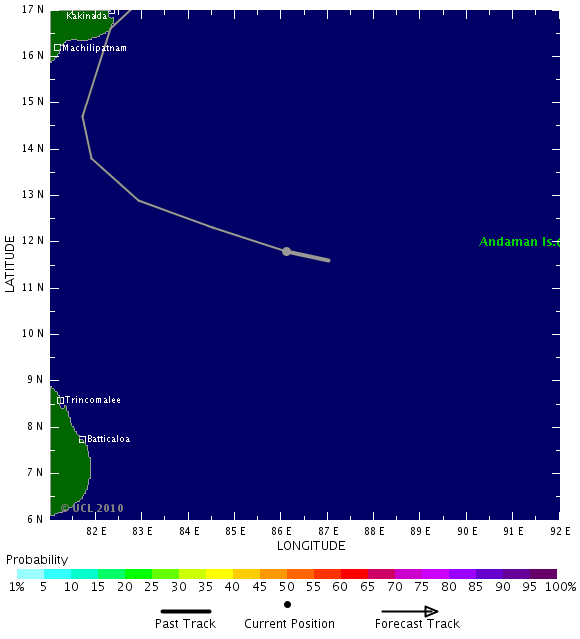 "TS" means winds upto 35 knts. Cat1 would mean the storm upgrading to "Cat 1" (severe cyclone) would be if winds are in the 34-63 Knts, 63-118 Kmph range. This system is forecasted to reach Cat 1,or severe cyclone status within the next 36 hrs. Expected movement will be North-West, initially. Strong possibilities of re-curving Northwards, or even North-East just before striking the coast.See Track from Tropical Storm Risk.